What kind of man does not want a unique watch? Probably one that does not like knowing the time! The vast selection of watches available these days really makes it quite easy for us men to find a fairly unique watch that will stand out from the crowd. It is essential to have a descent budget if you want a time piece that will really make a unique statement, most of the lower end watches have a very similar design and can be quite boring. You want your watch to be something special and not just another item your going to discard after a few weeks. With this in mind, and the fact that I have reviewed tons of watches in a wide price range, I’ve decided to make it easier for you to find a unique watch based on my personal opinion. Since the majority of my time piece experience is with men’s watches, this list is geared to men, or women seeking something with a masculine flair! I will also try to cater to various budgets. 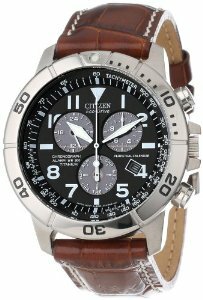 You may click on the links included for each model if your seeking more information for that particular watch. If your looking for something unique on a tight budget, look no further then this little ripper. It’s not considered a classy watch, nor is it luxury. 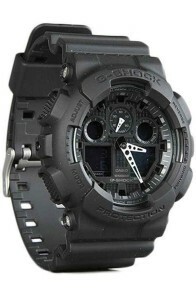 This blacked out digital watch is a military sports watch, it’s sure to stand out as something very unique in a crowd of mundane dress watches when commuting to work in the morning or out for a bite to eat. This watch is also number 1 on my list of best military watches for men, because it performs the job and looks the part all at a very reasonable price. I love this watch, it’s super unique in design and function. As stated in the model name, this watch is for those who like to conserve energy, in style. This time piece is rocking a super slick tanned leather band, with a beautifully crafted titanium bezel and case, kind of reminds me of the Jurassic Park movie and I’m really not sure why. It’s water proof up to a whopping 200 meters and suitable for diving, light weight and very comfortable wear. Get ready for questions while wearing this unique watch. It’s also not rare to hear of watch collectors drooling over this piece, grab one while you can! Here’s something a little pricier, although not so much that it’s out of reach. If your looking for something really cool, and something that your ready to take care of and cherish for as long as you want, then this could be the unique watch you’ve been looking for. You can consider it a luxury watch, but it’s also quite modern which I find makes quite unique. It’s got a great color as well, coming off as a deep dense ocean blue, it’s also available in some other stand out colors as well. 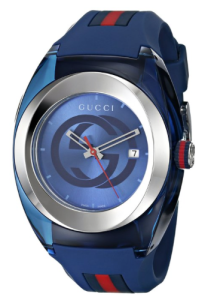 This watch is of course stamped with the prestigious Gucci logo, who knows when they will stop producing this piece, it may eventually be a one of a kind for your collection. Last but not least, a sophisticated divers watch. This one may not jump out to you as something extremely flashy, it has more of a confident look for men, but I would consider it unique none the less. I really like its all metal style, and submariner looking bezel, it looks like a very serious divers watch and people will ask you about it. The quality is excellent on this time piece, it has a very robust durable feeling to it. The hands and indicators are also glow in the dark, which is very convenient in low light situations. This model may be a little more conservative then what your looking for but it does offer more then your contemporary time piece on a reasonable budget. I came across your site and found it very informative. Have you ever thought about doing an American watch review ? Ball, shinola, Hamilton etc? I saw that you have some Hamiltons but none of the others.